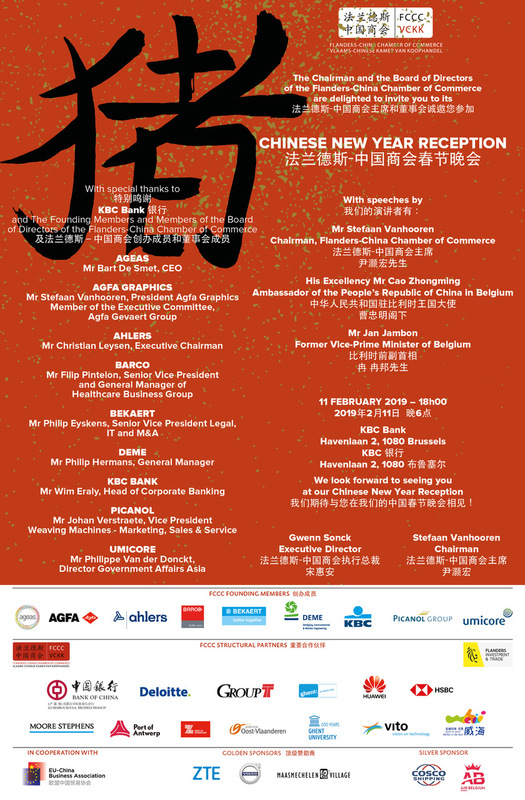 On 11 February 2019, the Flanders-China Chamber of Commerce will celebrate Chinese New Year!. The FCCC New Year Reception will take place at 18h00 at KBC Bank in Brussels. Speeches are followed by a networking reception. The reception is organized in cooperation with the EU-China Business Association. We would like to offer your company the opportunity to give more exposure to Belgian companies active on the Chinese market and Chinese companies present in Belgium. Below you will find more details on the sponsorship opportunities for the Chinese New Year Reception. If you are interested in sponsorship, please send an e-mail to: gwenn.sonck@flanders-china.be. We thank you in advance for reading our proposal and hope to meet you at our New Year Reception! The Flanders-China Chamber of Commerce, the Port of Antwerp and Flanders Investment & Trade organized the information session: A new ‘Single Permit’ for work and residence on 19 December at the Antwerp Port House in Antwerp. On 1 January 2019, the new Single Permit immigration scheme enters into force. In this seminar, we focused on the changes this Single Permit scheme will bring and how the new process and rules will impact high-skilled immigration towards Belgium. The Flanders-China Chamber of Commerce (FCCC) is organizing a meeting and reception with the Ambassador and Consuls General of Belgium in China with sponsoring of Dawo Law Firm Shanghai. This event will take place on Monday 28 January at 18h00 at ING Belgium, Troonstraat 1, 1000 Brussels. The participation fee for members is 55 € (excl.VAT). The fee for non-members is €85 (excl.VAT). I²PCC they are gladly making available this network to Flemish cleantech companies. Read: unique contacts in very diverse Chinese regions and niche markets. Discover on February 5 what I²PCC could do for your company. You will get an insight into the Chinese economy, inspiring examples of Flemish successes in China and the possibility to evaluate your cleantech innovation compared to the potential of the Chinese market in the selected regions. I²PCC is a common project of the provinces of Antwerp, Limburg, East-Flanders and Flemish-Brabant, with support of Cleantech Flanders, Flanders Investment & Trade and the Flanders-China Chamber of Commerce. The project is receiving financial support from the European Fund for Regional Development (EFRO).